Marvel's favorite family of mutants returns to trading cards this summer in an all-new series, "X-Men Archives". Following on the heels of out past SOLD-OUT Marvel products, this 72-card collection will offer a retrospective of the key members of the X-Men and various X-Men groups from 1963 to 2009! Each box of this set will feature 1 Hand-Drawn, Color Sketch Card from over 75 different artists. Below is a list of artists who have agreed to participate in this trading card set so far. For every three cases purchased you will receive a unique sketch card created in mixed art medium by Andy Price. For every six cases purchased you will receive a sketch card drawn by either Renae DeLiz or Tom Palmer! For every 15 cases purchased you will receive an X-Men Archives Archive Box containing a random assortment of 25 sketch cards. PRE-ORDER Shipping June! 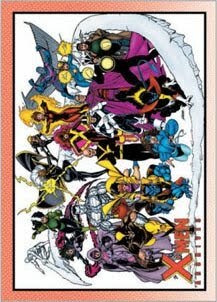 X-Men Archives Trading Card Base Set of 72 cards, featuring a history of the X-Men from 1963 to present! PRE-ORDER Shipping June! Full box of X-Men Archives Trading Cards. Each box contains 1 hand-drawn, colored sketch card!!! 24 Packs per box, 5 Cards per pack. PRE-ORDER Shipping June! Full, 12-box case of X-Men Archives Trading Cards. Each box contains 1 hand-drawn, colored sketch card!!! Each case comes with 1 of 3 different exclusive sequentially numbered X-Men Team Cards. PRE-ORDER Shipping June! This is the P1 general distribution promo card. Get this card for free with the purchase of a X-Men Archive factory sealed box. PRE-ORDER Shipping June! This is the X-Men Archives Trading Card album. Each album comes with an exclusive promo card. All logos and artwork are ™ and © their respective companies. This website and its format are © Digital Heroes. Digital Heroes is not affiliated, endorsed or sponsored by any of these companies in any way. Other companies produce the cards, and Digital Heroes sells them. 'Nuff Said! - yeah, that's not ours either.